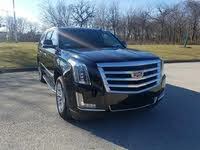 CarGurus has 13,254 nationwide Yukon XL listings starting at $1,995. Everyone knows GMC’s Yukon is a big sport ute. Well, the 2017 Yukon XL is even bigger, offering over a foot and a half of additional overall length. The stretched version offers the same 7/9-passenger capacity as standard versions but packs more cargo space and some added second- and third-row legroom. Finding a place to park this beast could be a challenge, though, and forget about fitting it into the average-size garage. This plus-size truck-based hauler debuted for the 2000 model year and, after a comprehensive redesign in 2015, is now in its fourth generation. It comes in 2 trims: the SLE and SLT, with a third trim, the top-shelf Denali, covered in a separate preview. All trims offer standard rear-wheel drive (RWD) or optional part-time 4-wheel drive (4WD). The 4WD packs a 2-speed transfer case and low-range gearing for off-roading, should you desire, and both drivetrains feature an electronic locking rear differential. Yukon XL trims are delivered with a 10-foot, 10-inch (130-inch) wheelbase and an overall length of 18 feet, 8.4 inches (224.4 inches). 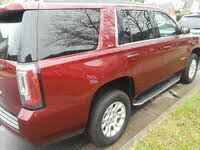 In comparison, the regular Yukon offers a wheelbase of 9 feet, 8 inches and an overall length of 16 feet, 11.9 inches. Those extra inches work out to a total cargo capacity of 121.7 cubic feet in the XL, with 38.9 cubic feet behind the third-row seat backs. Total cargo space in the standard-size Yukon is 64.7 cubic feet total, with only 15.3 cubic feet available in back of the third row. For 2017, the Yukon XL lineup gets a new exterior color choice, Dark Sapphire Blue Metallic, and newly optional 22-inch 7-spoke Silver wheels with chrome inserts. Inside, cabin backlighting is changed from Red to Blue Ice, and the current heated and cooled front seats that come standard on the SLT will be replaced by heated and ventilated seats. Hidden low behind the grille, new active aero shutters will also come standard on both trims next year. These shutters enhance aerodynamics by automatically closing at highway speeds, then reopening when extra engine cooling is needed. The SLE and SLT will again offer the standard 5.3-liter flex-fuel V8 engine for 2017. This mill is managed by a 6-speed shiftable automatic transmission and puts out 355 hp and 383 lb-ft of torque. Look for EPA mileage estimates of 16 mpg city/23 highway/18 combined in RWD versions and 15/22/18 in 4WD trims. The RWD variant’s current 8,300-pound towing capacity and the 8,000-pound towing maximum for 4WD editions are expected to go unchanged. One track test had an impressive 0-60 mph time of 7.2 seconds for a comparably equipped Chevy Suburban in both RWD and 4WD garb, but Ford’s similarly sized Expedition EL did the run in 6.5 seconds. Expect the 2017 Yukon XL’s cabin to again feature added soundproofing qualities for an almost silent ride, even at highway speeds, with accents and trim pieces that reflect high-quality materials and workmanship. Front and second-row seats are comfortable and supportive and can be selected in a number of configurations. Front bucket seats and 60/40 split-folding second- and third-row bench seats are standard, with second-row captain’s chairs optional. The second-row seats also feature a power-release mechanism, allowing easier third-row access. Be advised that although the third-row provides plenty of shoulder room, it sits low to the floor and tends to leave average-sized adults sitting with their knees uncomfortably close to their faces. And the high cargo deck might lead to difficulties loading heavy or bulky items. The base Yukon XL SLE comes with standard alloy wheels, a roof rack, and a trailer hitch and wiring; a large IntelliLink infotainment touchscreen offering Apple CarPlay apps and a 4G LTE Wi-Fi hotspot dominates the center of the dashboard and interfaces with the standard 9-speaker Bose premium audio system. The SLT offers standard power-folding mirrors, perforated leather upholstery, a power liftgate, power-adjustable pedals, memory for driver settings, a heated steering wheel, and a power-folding third-row seat. An optional heavy-duty towing package with enhanced transmission gearing, an auto-leveling suspension, and a trailer brake controller can be used to replace the standard hitch and wiring setup, while an Open Road package, featuring a power sunroof, rear-seat DVD/Blu-ray entertainment, and GPS navigation, is also available. The rear-seat entertainment system, which is also available as a standalone option, has been upgraded for 2017 with a new voiceover feature that aids the visually and hearing impaired, while other new enhancements include a set of digital headphones. An HDMI/MHL connector will now allow data from a single handheld device to be projected onto the rear-seat screen(s) by way of a new DLNA server interfaced with the Wi-Fi hotspot, and a new second USB port will provide a 2.1-amp charge to your iPad. Also expect the optional Yukon XL SLT Premium Edition, with bright body-side moldings, added exterior chrome, and polished exhaust tips, to return for 2017. Standard safety features aboard this stretched Yukon include antilock brakes, traction and stability control, front side-mounted airbags, 3-row head curtain airbags, and OnStar emergency alerts and communications. Front and rear parking sensors, a rear-view camera, front fog/driving lights, daytime running lights, and a post-collision safety system also come standard, while the SLT sports standard turn-signal-integrated mirrors. And for 2017, a programmable Teen Driver Safety System, similar to Ford’s popular MyKey package, is added to both Yukon XL trims. An Enhanced Driver Alert package that features a forward-collision alert with low-speed automatic braking, lane-keeping assistance, blind-spot warnings, and a vibrating safety alert driver’s seat is optional on both trims, while the SLT is eligible for optional adaptive cruise control. In testing by the National Highway Traffic Safety Administration (NHTSA), the 2016 Yukon XL received 4 out of 5 stars, with 4 stars awarded for frontal-impact protection and a top score of 5 stars given for side-impact protection. The Insurance Institute for Highway Safety (IIHS) has not tested this out-size Jimmy due to its sheer bulk. Look for the 2017 Yukon XL to go up against the Ford Expedition, the Chevy Suburban, and the Toyota Sequoia in a segment that’s gaining popularity as gas prices drop. 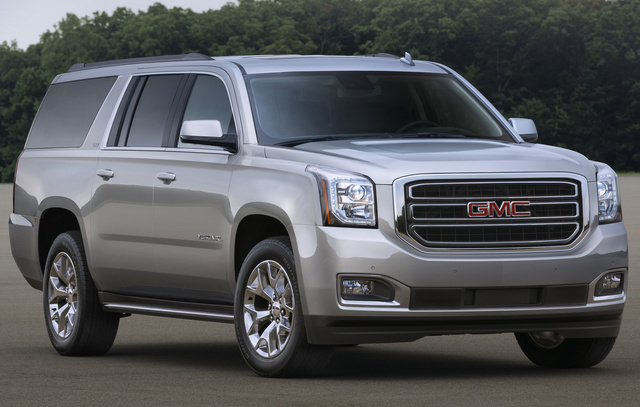 What's your take on the 2017 GMC Yukon XL? Users ranked 2017 GMC Yukon XL against other cars which they drove/owned. Each ranking was based on 9 categories. Here is the summary of top rankings. Have you driven a 2017 GMC Yukon XL?